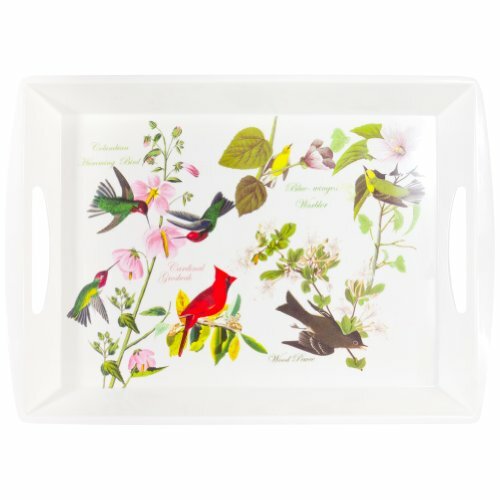 Birdwatchers will find many uses for this white plastic serving tray featuring artwork by ornithologist, John James Audubon. Depicted in their natural setting with colorful and delicate flowers are a Columbian Humming Bird, the Cardinal Grosbeak, the Blue-winged Warbler, and the Wood Pewee, all with their names printed in green, red, and black. The cut-out handles on the sides of this durable serving tray make this a comfortable convenience bird lovers will enjoy using for meals or snacks.